Cliff House on the Hudson is accessed through a private drive that winds through park-like grounds around a dramatic Japanese inspired garden featuring cypress, scotch pine, maple, sequoia and shaggy birch trees. All boulder lined with waterfalls cascading into a koi pond. Ideal as a getaway or full time residence, Cliff House makes entertaining effortless with its gracious window lined living/dining areas, light filled gourmet kitchen, and sunken family room with soaring cathedral ceiling. Nearly every room in the house has access to its own exterior deck or balcony looking over the pool and spa with an additional waterfall feature. 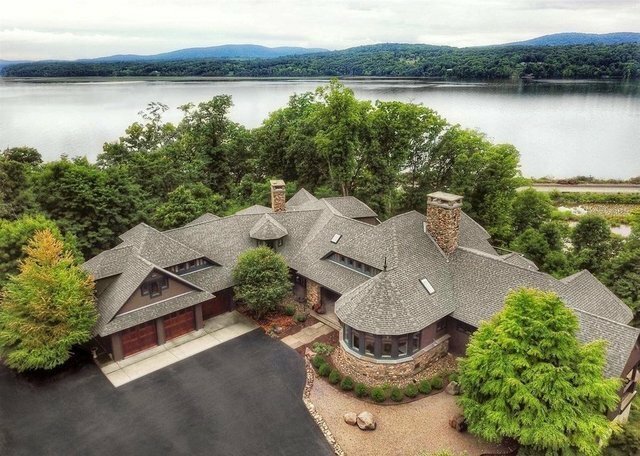 All take in the seasonally changing, always phenomenal views and year round sunsets of the Hudson River and Catskill Mountains. Nature and Hi-tech are in harmony at Cliff House where every rooms microclimate may be adjusted. No expense was spared in the creation of this majestically proportioned stunner built on solid bedrock. The 1860 refurbished Jones Carriage House affords even more living space and has further unlimited potential. Although the main house is exquisitely secluded in a backdrop of birdsong and rustling treetops, it's located just 1 1/2 miles from Rhinecliff Amtrak station, 2 1/2 miles from shops and restaurants in Rhinebeck Village and 20 minutes from the NYS Thruway or the Taconic State Parkway. Unique in every sense of the word.